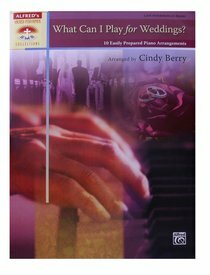 This collection contains every type of arrangement that a pianist might need when playing for a wedding. Included are traditional pieces for the processional and recessional, as well as additional arrangements---both classical pieces and hymns---that can be played as preludes or during the lighting of a unity candle. Approximate performance times for each piece are included to assist in planning. Titles: Bridal Chorus (Wagner) * Canon in D (Pachelbel) * Holy, Holy, Holy (Dykes) * Air (from Water Music) (Handel) * Panis Angelicus (Franck) * Arioso (from Cantata No. 156) (J. S. Bach) * Savior, Like a Shepherd Lead Us (Bradbury) * Be Thou My Vision (Traditional) * Psalm 19 (Marcello) * Wedding March (Mendelssohn). About "What Can I Play For Weddings?" What Can I Play For Christmas?